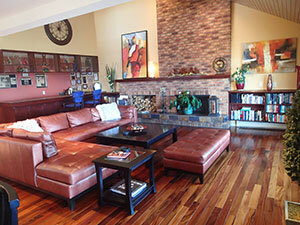 A stylish Bed and Breakfast located in beautiful West Kelowna, British Columbia, Canada, in the heart of Canadian Wine Country! Spend a little time in paradise, Kelowna style! 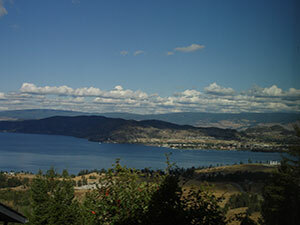 Located only 10 minutes from Kelowna City Centre, our B & B, offers luxurious accommodations to visitors to the Okanagan Valley, a prime tourist destination in the Interior of British Columbia, Canada. Overlooking Lake Okanagan, we are situated just across the bridge from the City of Kelowna, making our B & B a great home base from which to enjoy so many activities! Our award-winning Bed & Breakfast offers 4 beautifully appointed ensuite guest rooms with separate entrance, a lounge and patio area for all guest to enjoy, and absolutely incredible views of nearby Lake Okanagan, Monashee Mountains and of the city of Kelowna! Although we are adult-oriented, children over 12 are welcome. We regret that we cannot accommodate any pets. 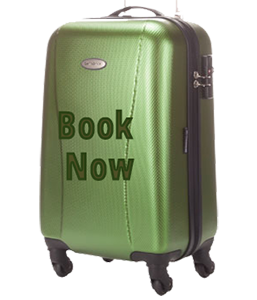 Get the lowest rates by booking directly through us! CLICK HERE NOW! Visitors to our West Kelowna Bed & Breakfast enjoy delicious breakfasts thanks to professional Chef Steve Marston's culinary expertise. Steve's love and appreciation for fine cuisine has taken him around the world. 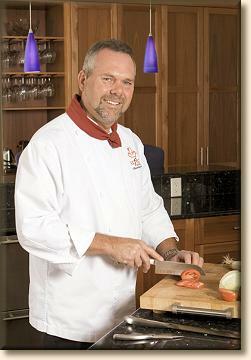 He is always looking for fresh ideas and trends utilizing the best local produce and ingredients. His eclectic combinations of international flavours will delight your taste buds at the breakfast table in the morning. Because we are located in West Kelowna only 10 minutes across the bridge to Kelowna's downtown area, you can enjoy many nearby activities, from fine dining and winery visits to hiking, biking, water sports, golf and more. Click here to view just some of the many attractions and activities to "see & do" in and around Kelowna when you use our b & b as your home base! 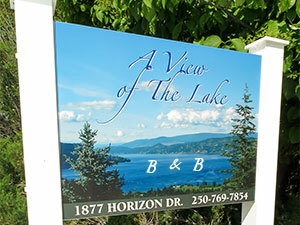 A View of the Lake B & B is Tourism British Columbia Approved . 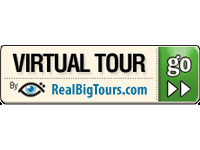 We invite you to view a "Virtual Tour" of A View of the Lake Bed and Breakfast by clicking on the link below. 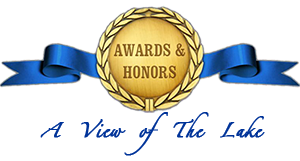 Our facility has received a wide range of awards over the years, and mentions of our B & B can be seen in a variety of publications, such as Fodors, Fromers, Berlitz Travel Guide, and Lonely Planet. Our bed & breakfast is even mentioned in the book "1,000 Places to See Before You Die", by Patricia Schultz!